Paul VI was the first pope to travel the world and witness extreme poverty. His ground-breaking encyclical Populorum Progressio laid out fundamental teaching about authentic human development, calling on us all to live simply, sustainably and in solidarity with the poor. It is a crucial text for CAFOD. Oscar Romero was transformed by his time spent among the oppressed people of El Salvador during a violent dictatorship and grew in solidarity with them, to the point of martyrdom. At CAFOD, we were privileged to count him as a partner and friend. Paul VI was 20 years older than Romero and became Pope when the latter was a 46-year-old parish priest. Romero knew the writings of Paul VI intimately, almost by heart, and we can say that he lived and died according to his Pope’s teachings about social justice and the faith. This was their physical meeting. The principles that Paul VI taught and that Romero lived show us where they met spiritually and intellectually: their belief in the dignity of the human person; the preferential option for the poor; access for everyone to the fruits of the earth. Find resources to celebrate and reflect on the life and canonisation of Romero in your school, parish or at home. In Paul VI’s teaching, particularly in Populorum Progressio and Evangelii Nuntiandi, we find a picture of a Church in the process of renewal. This was renewal through listening to neglected voices around the world, especially those of the poorest people. Romero’s life perfectly illustrates this. When ordained Auxiliary Bishop to San Salvador in 1970, he was seen as a reactionary bureaucrat, suspicious of those clergy who supported the cause of rural farmers. But when he was then sent to Santiago de Maria and found himself ministering to desperately poor coffee-harvesters, he rediscovered his own humble roots. Conversations with them at the night-shelter brought home to him the significance of the Church’s option for the poor. Could it be that, as the bishop listened to the campesinos night after night, there was a two-way encounter in which he learned more from them than they from him? Perhaps it was here that he experienced the “profound change of mind and heart” that Pope Paul VI tells us is essential to gain the Kingdom and salvation (Evangelii Nuntiandi #10). This experience, and the assassination of his friend Fr Rutilio Grande by the security forces, lit inside Romero an inextinguishable fire. For the few remaining years of his life he stood firm alongside the poor of El Salvador, despite persecution and violence. Find out more about CAFOD’s work in El Salvador today. Pope Paul VI noted that people who are poor are often the most receptive to the Gospel. He also taught that working for justice and liberation is central to living out the Gospel message, as Oscar Romero’s example shows us so powerfully. Pope Francis, who will canonise both these men, shares their vision of a Church that goes out to meet the poor and excluded. This culture of encounter he says, compels us “to draw near, to touch, and to say: ‘Do not weep’”. It is what makes Pope Paul VI and Oscar Romero saints we can truly venerate. 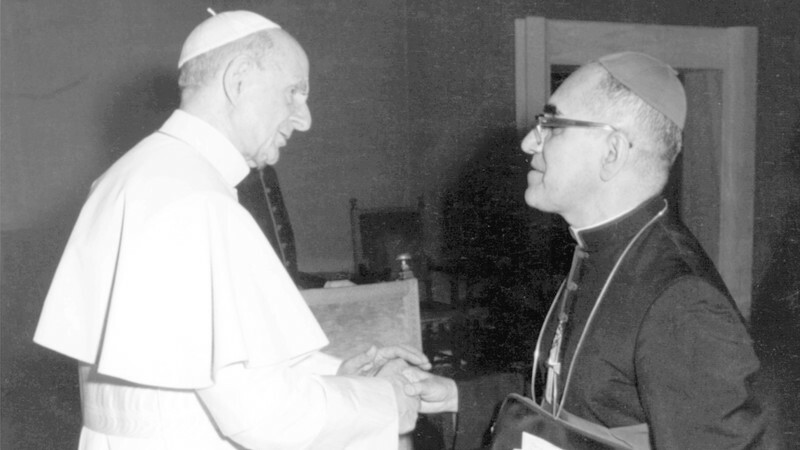 Read Francis Stewart’s full reflections on the connection between Pope Paul VI and Oscar Romero.